Come explore New York City with Sophie as she travels to different worlds in her Daddy's office building! Learn about fashion, design, weddings, and the glamorous life inside magazine publishing. Even though Sophie enjoys her time discovering new and magical worlds on each floor, she realizes it is more fun to share amazing experiences with the ones you love, your family. See New York City through the eyes of a curious, adventurous, and imaginative little girl. Sophie comes from a very posh world. Her clothes are designer clothes. Her Father’s car is a Mercedes. She comes from a life that just about every little girl fantasizes about! 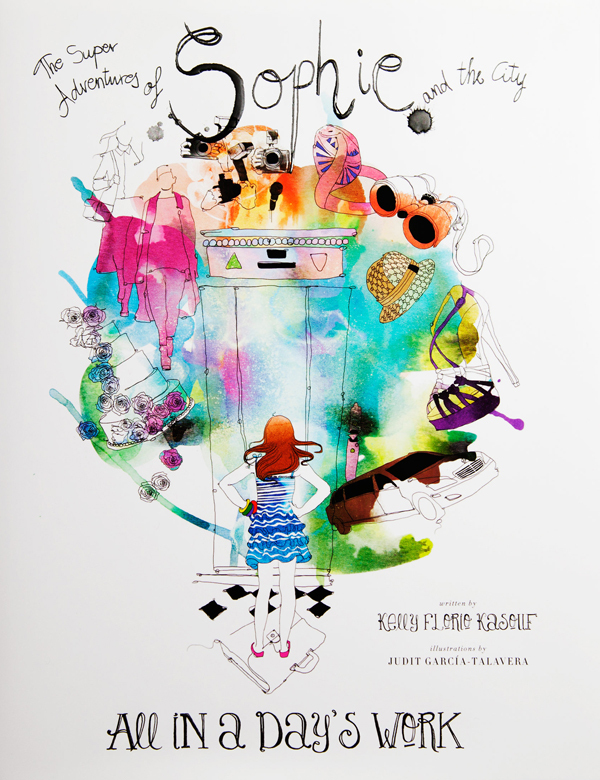 While visiting her Father’s office, she enters the imaginary world of fashion. She is introduced to the legendary women trendsetters in fashion and how they set the pace for designers to become more creative. The book describes how famous clothing designers conjure up their inspirations. Sophie also shares her imaginary desires to visit exotic places, see lavish parties and attend sophisticated weddings. In the end, though, Sophie realizes that her biggest inspiration wasn’t anything she saw in her Father’s building. It was right in front of her! The Super Adventures of Sophie and the City is a beautifully illustrated, tender book about materialism versus love of family. The story is gloriously accentuated by elaborate watercolor drawings and scrolled type. It is truly a work of art in every respect. Kelly Florio Kasouf was raised on the North Shore of Long Island and majored in studio art with a concentration in Printmaking and bookmaking at the College of the Holy Cross. After graduating, it was only a matter of time before she found herself back at the company her father lived for, Condé Nast Publications, where she soon began her career as an intern, then a merchandising assistant at Vanity Fair, and finally a special events manager at Vogue. From visiting as a young girl to interning to working, Kelly grew up inside the walls of Condé Nast. This story is an homage to her father, who passed away in December 2007, and to those in the industry who truly loved him as a leader, a man, and above all, a great storyteller. This is her first children's book. The stories are partially based on life experience. Judit García-Talavera was born in the Canary Islands of Spain, Judit has always been surrounded by beauty. After attending an arts-oriented high school, Judit first fell in love with illustration as a means of capturing the beauty around her. She earned a degree in Fine Arts at the Universidad de La Laguna, and has participated in several workshops in the Canary Islands, such as the Centro de Arte Gráfico La Recova in Santa Cruz de Tenerife. In 2004 she moved to Barcelona to continue her studies in illustration at the Massana Permanent Academy. Judit presently lives and works in Barcelona. in the iTunes App Store. Check back soon.